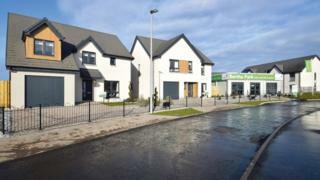 Scottish housebuilder Springfield Properties has reported a sharp rise in sales and profits. The Elgin-based firm said revenue climbed 38% to £75.7m in the six months to the end of November, while adjusted pre-tax profit nearly doubled to £6.1m. In its interim results, Springfield said both its private and affordable housing divisions performed strongly. It added that it had been boosted by the acquisition of Glasgow-based housebuilder Dawn Homes in May. A total of 379 homes were completed over the period, a year-on-year increase of more than 35%. The company said it had also significantly strengthened its land bank after securing land for a new village in the Livingston area and acquiring Livingston-based housebuilder Walker Group. Executive chairman Sandy Adam said: "Looking forward, we have entered the second half of the year with a strong order book of contracted revenues and a greater geographic reach across Scotland. "With the sustained market drivers showing no sign of abating, Springfield is in a stronger position than ever to deliver many of the new private and affordable homes needed in Scotland."